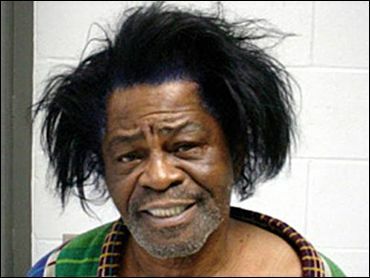 Soul singer James Brown was arrested Wednesday on domestic violence charges, authorities said. Brown, 70, was booked into the county jail and was to appear at a bond hearing, said jail supervisor Nicholas Gallam. Known as the Godfather of Soul, Brown was honored last month at the Kennedy Center as "one of the most influential musicians of the past 50 years." Brown, who lives in South Carolina, has also had a number of legal problems over the years. Brown served a two and a half year prison term after a 1988 arrest on drug and assault charges, and was convicted of a drug-related offense in 1998. He was granted a pardon by the state in May. Three years ago, Brown was the target of a lawsuit filed by a former employee who claimed he was guilty of sexual harassment. A Los Angeles jury sided with Brown on the sexual harassment allegation, but in February 2002, also ordered that he pay Lisa Ross Agbalaya $40,000 in back wages - about a year's pay, and a lot less than the million she sued for - on the grounds that she shouldn't have been fired.